Creating your musical legacy starts with Finale. 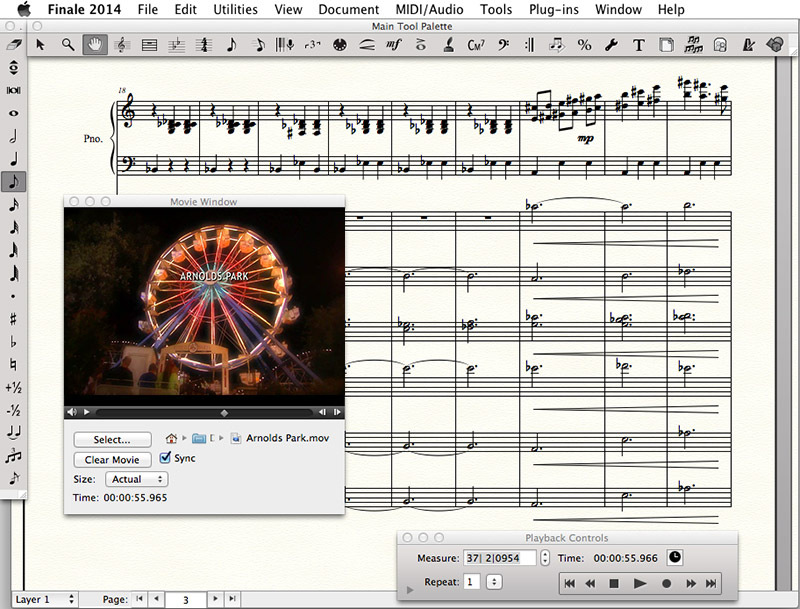 Easily arrange or compose publisher-quality music notation that plays back with world-class sounds. Share the results as sheet music, audio files, or via the free Finale SongBook® iPad app. From lead sheets and guitar tabs, to band charts and orchestral scores, Finale is the forward-looking choice. Composers and arrangers are inspired to greater creative heights by spectacular Garritan sounds and Human Playback, enjoy idea-generating features like auto-harmonization, and rely on essential tools like range checking and transposition. Music educators save time with Finale. 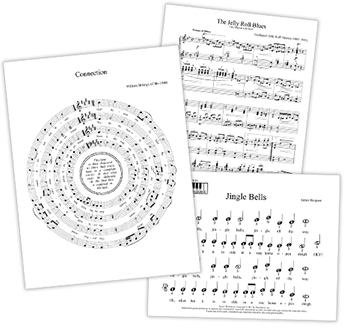 More than 1,000 customizable music education worksheets, the Exercise Wizard, and education-specific fonts help produce curriculum quickly, and only Finale can create SmartMusic accompaniments. Engravers enjoy the freedom to bring their imagination to the printed page. Copyists create music quickly with features like Linked Parts. Finale is perfect for composers, arrangers, educators, students, and anyone who wants to share their music with the world. Allows customers to share their music via the free Finale SongBook® iPad app. import/export, MicNotator®, Record/Import Audio, and more. Listen as you create your music. SmartMusic provides the ideal practice environment for students, including access to the world’s largest accompaniment library and instant feedback on each performance. … you have the customized tools and resources you need to teach and inspire your students. And, with Finale’s Exercise Wizard, you can create more than 50,000 exercises for your entire ensemble. Easy Note Entry - Enter notes with your computer or MIDI keyboard. Keystrokes are intuitive and a special key map for laptop users is provided. Best of all, if you prefer certain key commands, change the defaults in Finale to whatever you like. HyperScribe - Enter notes in real-time as you play a MIDI keyboard. You can play along with a click, provide the click as you play (for example with a sustain or other foot pedal), or enter the pulse later. Record your live vocal or instrumental performance — an exclusive Finale feature. Recording first and second endings with HyperScribe is seamless. Finale skips over the first ending on the second pass, allowing for smooth transitions. Specify a playback tempo before you record or Finale can record at the tempo you use when playing your MIDI keyboard. Record continuous data including the sustain pedal. Listen to a performance recorded in HyperScribe without Continuous Data. Now listen to the same performance recorded in Hyperscribe with Continuous Data. With MicNotator no MIDI is required. This revolutionary technology allows you to enter notation into Finale simply by playing your brass or woodwind instrument. Pick up your clarinet and start making music! This example is an unedited flute solo line played in at 90 bpm. SmartScore X2. You’ll enjoy improved recognition of musical symbols, especially on poorly-printed scores (and even some hand-written style lead sheets), as well as from scanners with less-than-optimum optics. Scanned into Finale: Only 5 easy edits needed. Another notation product using PhotoScore Lite™: 30 difficult edits needed. Smartscore Lite X2 is designed to scan original engraved music – not handwritten scores. These examples were scanned from original engraved music using a Canon N670U scanner at 360 dpi. Both images were untouched to enhance results. The PhotoScore example was transferred, without edits, to a competitor’s product. The time to correct errors in the two examples: Finale, 10 seconds to add missing rests and tie necessary notes, hence the term ‘easy edits’ compared to the 2 minutes it took to add Voice 2 notes, correct notes, change notes from Voice 1 to 2, etc., in the competitor’s product, thus the term ‘difficult’ or time-consuming edits. Finale is also compatible with full-fledged scanning products including Smartscore X2 - Professional, sold separately, these products offer expanded recognition. *Scanning directly from Smartscore Lite within Finale is supported by nearly all Windows scanners and Epson scanners on Macintosh. Recognized 8 Staves max. No limit 3 Staves max.